Eric Morelli had his way with the Gee-Gees defence on Friday night, as the second-year quarterback threw the ball with relative ease as the Golden Hawks downed Ottawa 65-30. 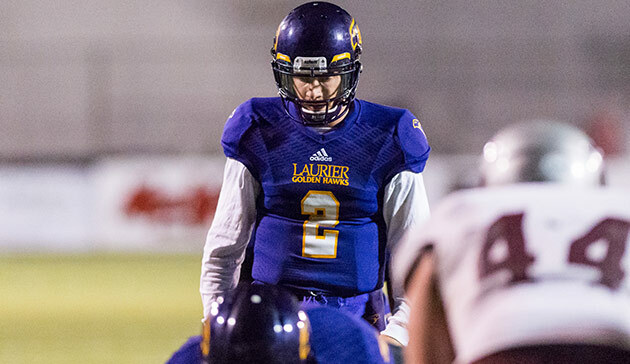 The second-year business student-athlete tied the Laurier single-game record with six touchdowns on the day, finding three different receivers for scores in the game. Morelli now accompanies legendary Golden Hawk Bill Kubas as the only other Laurier quarterback to throw that many touchdowns in a game. The 5’11’’ 195 lbs gunslinger led the Golden Hawks in their most offensively productive game in four years, all while battling for the final playoff spot in OUA. Morelli and the Golden Hawks will host the defending Yates Cup champion, McMaster Marauders, on Saturday at 1:00pm.